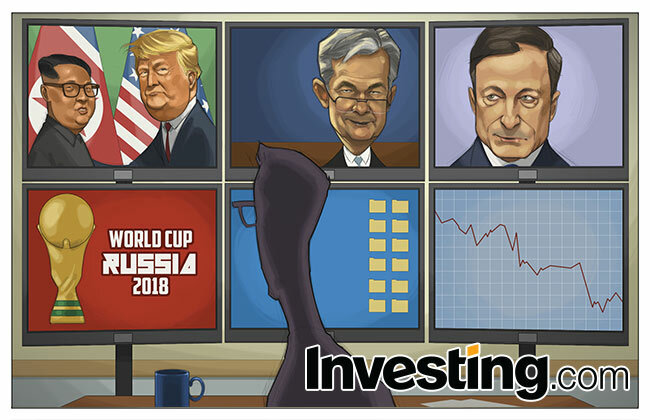 Weekly Comic: Trump/Kim Summit, Fed, ECB & World Cup – What A Week It Was! Investing.com – It was a busy week in financial markets. On Tuesday, a historic meeting between U.S. President Donald Trump and North Korean leader Kim Jong Un grabbed all the headlines. At the end of their summit in Singapore, Trump and Kim pledged in a joint statement to work toward complete denuclearization of the Korean peninsula, while Washington committed to provide security guarantees for its old enemy. Many experts expressed dismay at the agreement, however, saying it lacked a solid commitment by Pyongyang, while others said it was vague as to details. With the summit out of the way, market focus quickly shifted to central bank policy meetings. The Federal Reserve on Wednesday raised its benchmark interest rate by a quarter of a percentage point for the second time this year, taking it to a range of 1.75%-2%. Fed members took a slightly more hawkish policy tone in signaling two additional rate hikes by year-end, rather than the one additional move that had previously been expected. With the Fed out of the way, it was the European Central Bank’s turn to grab the spotlight on Thursday. The ECB said it will end its unprecedented bond purchase scheme by the close of the year, taking its biggest step in dismantling crisis-era stimulus a decade after the start of the euro zone’s economic downturn. Thursday also marks the start of the 2018 FIFA World Cup tournament in Russia, where the host nation takes on Saudi Arabia in a Group A match at the Luzhniki Stadium in Moscow. It has a 6:00PM start time in Moscow, which means 11AM ET. Most experts suggest defending champion Germany as having the highest likelihood of winning the cup, while Brazil, France, Spain and Argentina are also expecting to reach the late stages.